Let the fresh fruits of summer make your desserts shine with this easy Peach Berry Crumble. If you have ever met someone from Minnesota, you will soon find out that we are obsessed with the weather. And if you have ever spent a winter here, you know why. The main reason I endure the winter is because of summer. Summer is pretty magical here, and you certainly are not going to find people holed up inside sitting in the AC. We are outside every single second that we can manage. And that’s where simple desserts like this Peach Berry Crumble make my life a whole lot easier. Now I admit that my family is a little spoiled. We eat dessert. Every night. Granted, some nights it is a scoop of ice cream or a few cookies, but the “something sweet” is always expected and is always there. 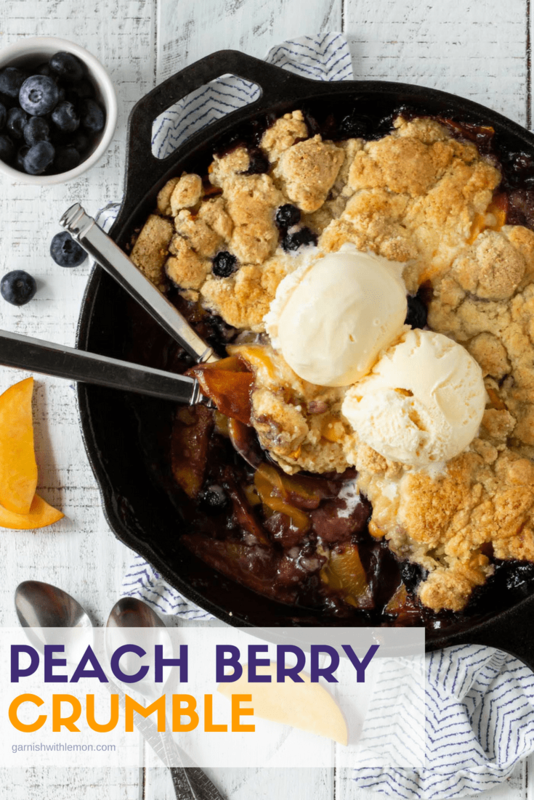 Now with summer in full swing and all of the fresh produce I can get at the farmer’s market, I let the fresh fruits of summer do the heavy lifting in this easy Peach Berry Crumble. A crumble topping is more cake-like than a crisp. 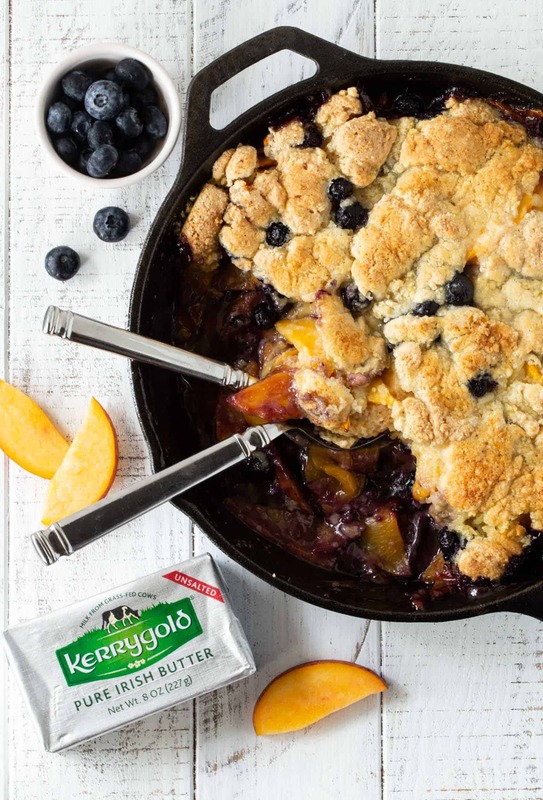 The recipe calls for our favorite melted Kerrygold butter that is drizzled over the crumble mixture before baking. That combination gives you the crunchy outside with the soft inside. 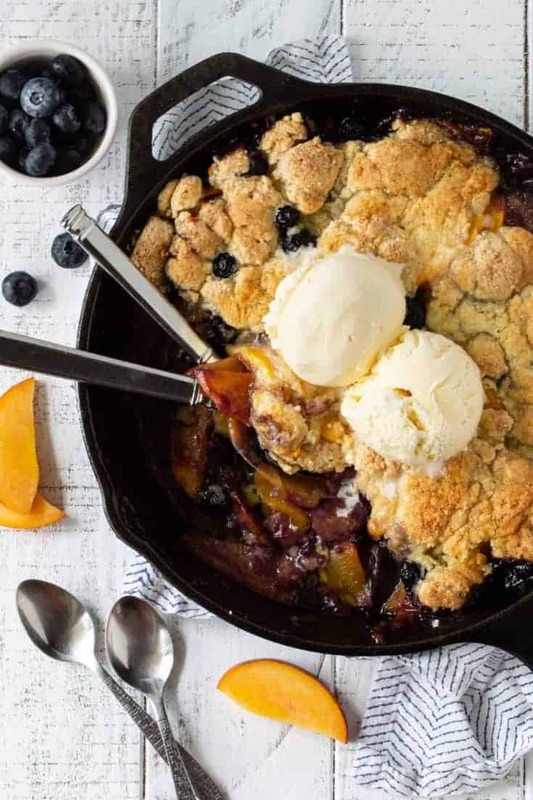 This Peach Berry Crumble dessert recipe showcases the abundance of fresh fruit available but doesn’t take a ton of time – a real summer lifesaver. Who wants to be spending hours in the kitchen when the sun is shining and you can be outside soaking in the beautiful weather? I know I don’t. I love simple dishes that make me look like I have my act together a whole lot more than I do some days. Doesn’t everyone need a go-to summer dessert like that? This delicious Peach Berry Crumble is mine. We’ve never met a crisp or crumble we didn’t love! Preheat oven to 375 degrees and set a 10 inch cast iron pan or 9 inch square baking dish aside. Place fruits in a medium bowl and sprinkle with cornstarch and sugar. Stir gently to combine and let sit until topping is made. In a small mixing bowl, place egg, oats, flour, sugars, and cream. Using a fork, combine until the mixture is the texture of coarse meal. Pour the fruit mixture into the pan and sprinkle crumble topping evenly over the top of the fruit mixture. Drizzle melted butter over the top of the crumble topping. Bake for 40 minutes or until browned and bubbling. Let sit for at least 15 minutes before eating. Serve with ice cream if desired. Peaches + berries make the best desserts!